Voices of Nicotine Recovery (VONR) formed October 15, 2004. One of our founding members, John R (oldhippydude), shares the “History of VONR” at our 7th Anniversary Marathon in these audio files: Part 1 | Part 2 | Part 3. A Brief History of Nicotine Anonymous (PDF) was written by another founding member, Gary M.
VONR’s primary purpose is to offer support to those who are trying to gain freedom from nicotine. We are a “voice” meeting site, meaning that our online meetings take place in a “voice enabled” room. We can literally talk to and hear each other share. We also have a message board for on-going communications, support, and fun throughout the day and night. Voice meetings are run much like a face-to-face meeting. We have a chairperson, a format, and a topic for discussion. We gather to support each other and to learn about 12-step recovery. You do not have to have a microphone to participate in voice meetings. Type shares are always welcome. You do need speakers, however, so you can hear. 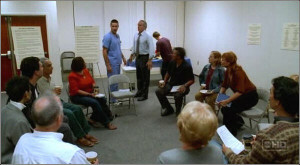 It is not necessary for you to have quit smoking to come to our meetings. Our 3rd Tradition states: the ONLY requirement for membership is a DESIRE to stop using nicotine. We encourage you to participate. All are welcome. By accessing this site, you agree that the material contained herein is confidential and protected by copyright laws and may not be used or exploited for any purpose, commercial or otherwise.